Ancienne Isle Taprobane. Die alte Insel Tabrobane. 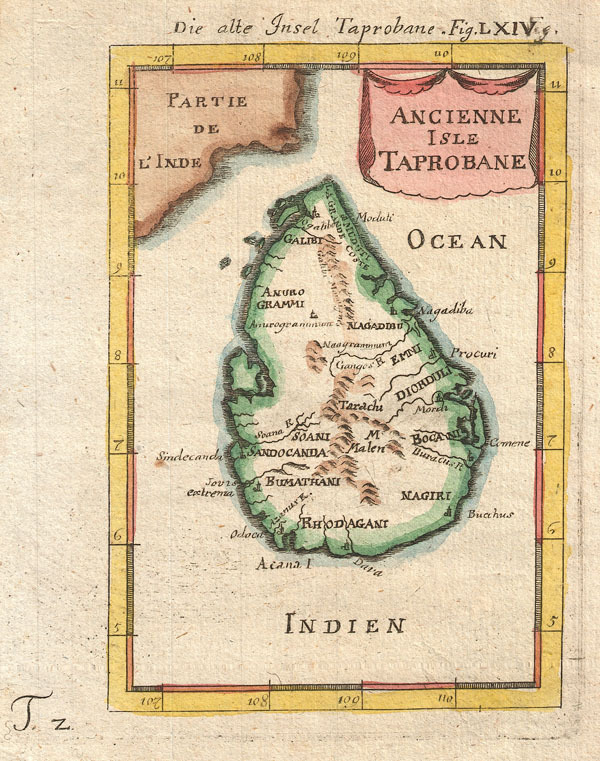 A beautiful miniature 1683 map of Ceylon, Sri Lanka, or Taprobane by Alain Mallet. This stunning little map covers the island of Ceylon as well as parts of adjacent India. Mallet first introduced this map in the 1683 though it was republished several time in the subsequent 20 years. Taprobane is an ancient name for a spice rich trading center that was well known in ancient Roman times. By the 17th century Portugese explorerers had reopened the route to the Indies but were uncertain exactly which island the Roman's were referring to. Some map Taprobrane as Sumatra, other as Ceylon. The common consensus now, as in Mallet's time, is that the Roman Taprobane is Ceylon. Published by copper plate in the 1686 Frankfurt edition of Mallet's Description de l'Univers. Mallet, A., Description de l'Univers, (Frankfurt), 1686. Very good. Original platemark. Blank on verso. Wide clean margins.